As you probably noticed, the old forum theme is gone, and our brave overlords are doing their best to replace it with something more visually updated. 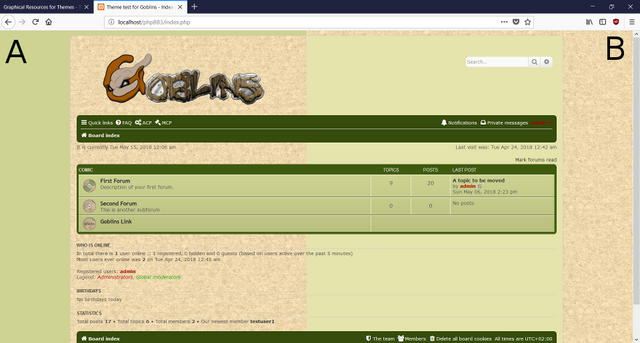 Now, I started to create another theme that will have a "green"-ish scheme in the hopes of fitting the old Goblins forum a little - and also because my eyes feel a bit strained by the black theme. I switched back to the prosilver in the meantime, but you know what they say: "If you want something done, do it yourself." 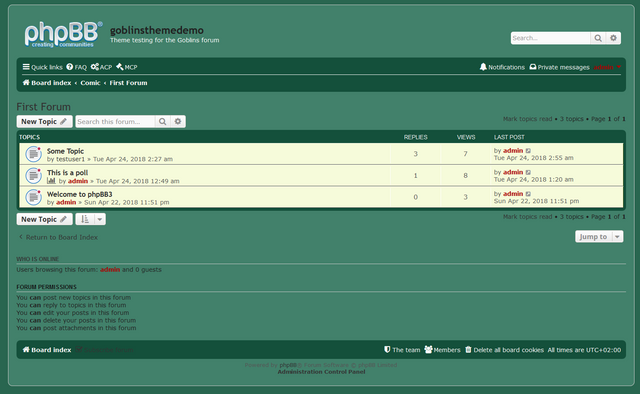 What I've done so far is "backported" the green-theme's (link posted by Mort in the forum update thread) color scheme to the original prosilver skin, and it kind of works, all I have to do now is changing the Logo and the forum icons to something more fitting. I'm looking for art from either the comic or your own that is Goblins themed. If you remember the old theme, it had shields instead of the round text-buttony bits. I want to bring back something similar, but things that are actually more in the style of the comic. So scrolls, shields, whatever I can find in the comic. Obviously, I'm starting to look for these through the archives, but if someone has the patience to get these - maybe even create alternatives -, I would greatly appretiate the help. So please help me finding adequate pieces by posting a link to the page! 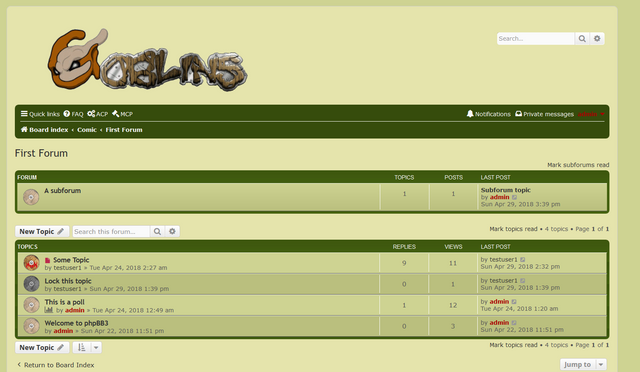 My only intent is to use them specifically on theming this forum so I hope I won't hurt any copyright issues with that. If you are good at photoediting, feel free to help in creating the variations of the icons! I'm also willing to help in creating different themes. You don't like green or you have your own idea? That's okay, I'd be pretty happy in helping your own theme, assuming our mods approve of this. I have some ideas for other themes, but first I'd like to create only one to see how much hassle is there with it. Axe of Prissian Theme: Black/yellow theme like the current forum theme, just a bit more simple and more "Goblinesque"
Note that I'm not too keen on otherwise decorating the forum items (such as frames and ornaments), but these theme ideas could use some of them. It'd require more time in getting them right, though. - If you think this is not that good of an idea or downright terrible, feel free in NOT advertising it more (I won't do it), or downright delete the thread. I promise not to re-post it or attempt to create an undesired theme anyway. I like the idea of using the KISS method for things. Keep them simple. I do like the current black theme, but then I've always been a fan of dark backgrounds since bright lights tend to trigger my migraines. Go figure. 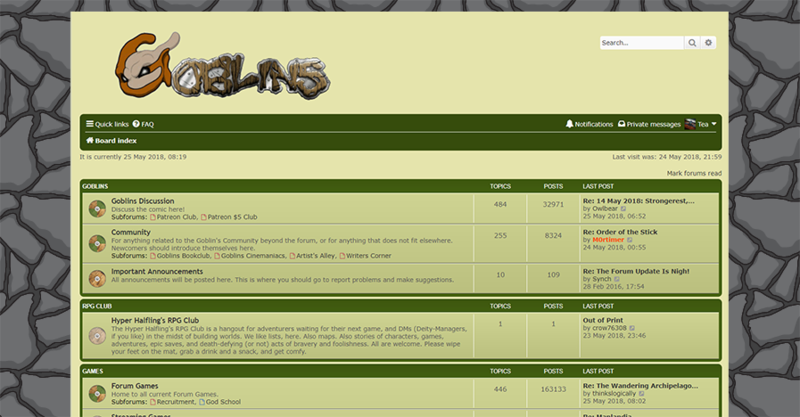 That being said, I do like how you're approaching an updated version of the Goblins theme. Personally, I'd change the background green to something with less yellow in it, more blue, but that's just my opinion. I tried the palette you linked, but the end-result is a bit "too cold" to my tastes, dunno if it would work well with the imagined items. That's better. I think a "warmer" theme would be better, but then I'm not really partial to yellow colors, unless it's pure yellow hues. Yellowed greens and oranges.... ewwww. As soon as I get proper icons, I'm willing to give it up for voting on color schemes. It would be nice to know whether we could have any big backgrounds or allowed to use one (as afaik there is only this rocky wall+big ears combo but that works only for dark themes). By the way, I faintly recall that the current Goblins logo had a "simpler" variation initially, with either wooden or metallic letters, or something? Does anyone have that one saved anywhere? Might fit certain themes better. Nevermind, found it in the resources Mort shared. I know he has a lot on his plate, but maybe Tarol might like to draw some icons and logo for us? Looks decent to me at least. Yeah, that's looking cool so far Inspired I like the colour scheme too. Well done mate, looks good. I'm a Graphic Designer in my spare time, if you want me to tweak any icons you find or add bits and pieces to em just yell out. I'm probably not good enough to create em all from scratch but I know my way around Illustrator and Photoshop. I still need to do Anouncement icons, then I'm sending everything over to Mort for final revision as I assume the template HTMLs still have to be tweaked to fit with other parts of the forum. Then we could maybe do a poll on color schemes, or maybe have some variety on the icon sets, as changing those are the smaller parts of the project. Also thx for the positive feedback, Everyone. Maybe it's just me, but something I liked about the old forum was how it had a background texture so it looked like cloth - not enough contrast to be distracting, but less plain than the current solid colours. Would that be possible to implement? As for me, I didn't particularly like that cloth/scroll like background, but you are right, something could be used to cheer the theme up a bit. Which part of the background you wished to change? See the picture below! Mort shared with me the old theme's graphical resources, so I quickly added the background in question. I'd prefer side A, personally. Would it be possible to put two different textures on the background and, uh, squashed background? Like a stone effect or something. Side A looks more like the old forum, but the solid colours on either side are distracting and emphasise how squashed the middle is. Sure, everything is possible. I don't think the "black rocks + BE background" the dark theme has would work as the "second" outer background, so we have to find something more suitable. Alternatively we could ditch the inner background entirely but that would make the forum fallen apart. I welcome every image suggestion you guys got. I've got to survive this week of final exams, but then I aim to be more useful and see what I can do to help with the graphics. In the meantime, I've got a few pieces of feedback. You're awesome. Did I mention how much you were awesome? I agree that the pure green layout would benefit from jazzing up the background a bit by giving us some visual contrast and I really, really like the stone wall background idea (although it might be difficult to find an image online that wouldn't be distracting as a background or too dark). Then again, one of my favorite parts of the main goblinscomic pages is the stone wall in the background image, but the problem with that image is that there's so much other stuff going on and with the wider forum space a lot of that background would be blocked and I'm worried it would be kinda dark and all I'd be seeing was a pair of blackish bars on the sides. I propose a modified thuntesque dungeon wall for the forum. I may also have a very soft spot for walls. I've got some ideas for things I can try and I would like to put together a few mock-ups to see if they would work (a basic wall, have the wall fade in/deteriorate, overlay the basic wall with another image of a light source+shadows, replace all the colors with greens...). Alternatly, how about a large-scale hex-map background? It has the advantage that it sounds a lot easier to make a repeating pattern . As for the icons, they seem to be coming along nicely and I like the shields/different weapons from the comics idea (I think that would be fun to pull off). One thing I've noticed, though, is that the current shields are a little difficult to tell apart. It's easiest to read the greyed-out shield (locked), the normal shield (normal), and the green-shield (unread topic), but the flames/shield with red mustache (hot topic) and shield with arrows (pinned) the changes only affect part of the icon so it's harder to see. In general, I'm also remembering that the shields on the old forum were a bit darker and had a shadow behind them (right now it looks a little like the shields are sinking into the page instead of coming forward out of it). I hope this helps and doesn't sound like too harsh a criticism; I aim to be constructive. I think it's awesome that you've taken the time and effort to take on this project. Hi Tea, thanks for the heads-up! I don't think that covering most part of the background would be an issue. I mean, the main point of the site is the forum in the middle. That being said, I don't have a widescreen monitor, and thus I don't see much of the background anyway. If it is indeed an issue for the forumers then some wider backgrounds might be appretiated. And likely some CSS / JS magic to load the appropriate one. In my opinion loading backgrounds should NOT take many resources off of both the devices and the connection, so the simpler the background, the better. 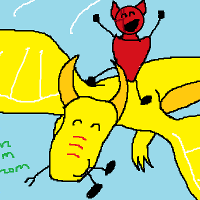 Feel free to make some backgrounds and run by Mort or the Duke! I think "home made" art is more appretiated than taking from somewhere from the internet. Giving the icons some drop shadow or highlight (glow) is a great idea, though! I will try to do them this weekend and see what I get. Hey, Glemp! I Checked out that link, it looks neat! I think we might be onto something. My only concern is that the image is free in the way you have to credit the author. Which is not an issue considering we can just add one more line to the footer (I did, it's just cut from the sample), I'm not sure what the admins opinion is about that, though. Oooo! I also think you're onto something. It's taken a little bit to get used to because it's not like the old forum's background, but I think I could get used to having something like that for the forum background. The large scale of the stones with the forum has a rather pleasing effect to me (although, this hasn't stopped me nabbing it for a reference image, I've been looking forward to seamless stone wall experiments). On an unrelated note, I've noticed the line dividing a person's signature from the main post is hard to see and makes browsing the threads a little confusing (it looks like it's an <hr> element). Maybe pick up the nice dark green from the footer so it stands out better? 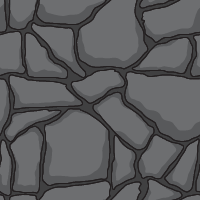 Alright, here's my first go at a repeating wall pattern. It works well on it's own and it's not too dark, my main concern is that maybe it's a little too complicated and distracting (and that I can pretty easily spot the repetitions when the forum's in front so I may want to revise and go for a nice rectangle instead of a square). 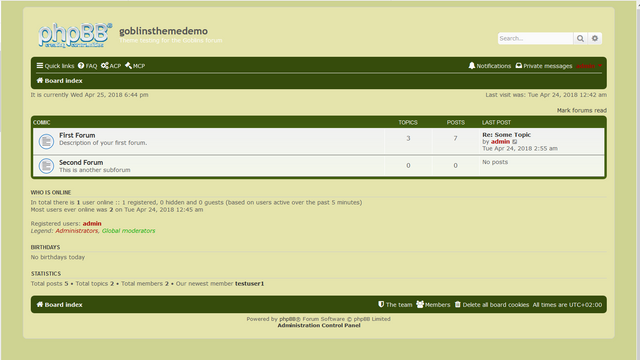 Photoshoped into a screenshot of the forum. The current scale is 400x400px and exported at ≅10 KB. 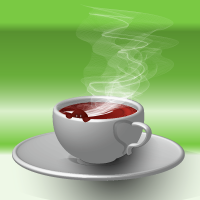 Hey Tea, that looks awesome! It has that "Goblinesque" vibe with the clear black outline and the solid colors with a hint of shadowing. Thank you! Goblinesque is what I was aiming for. I think I'm going to do one more wall and then see which one you guys like better (with some touch-up, if needed, before submitting it), then I'd be happy to assist with the icons. I'll save the other ideas for later (maybe another theme?). 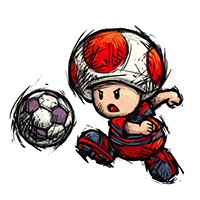 If you can provide cool backgrounds and icons, I think we are set for any themes the mods allow us to make... I have some ideas too, but want to work on this one first to iron out the process and see what to pay attention later on.